^ Froissart, Jean (1910). 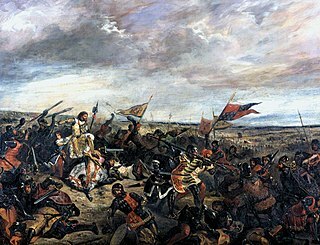 "The Battle of Poitiers". In Eliot, Charles (ed.). Chronicle and Romance: Froissart, Malory, Holinshed. p. 52. Retrieved 17 September 2018. Edward of Woodstock, known to history as the Black Prince, was the eldest son of King Edward III of England, and thus the heir to the English throne. He died before his father and so his son, Richard II, succeeded to the throne instead. Edward nevertheless still earned distinction as one of the most successful English commanders during the Hundred Years' War, being regarded by his contemporaries as a model of chivalry and one of the greatest knights of his age. Sir James Audley KG was one of the original knights, or founders, of the Order of the Garter. He was the eldest son of Sir James Audley of Stratton Audley in Oxfordshire. Sir Nigel is a historical novel set during the early phase of the Hundred Years' War, spanning the years 1350 to 1356, by British author Sir Arthur Conan Doyle and written in 1906. It is the background story to Doyle's earlier novel The White Company, and describes the early life of that book's hero Nigel Loring, a knight in the service of King Edward III in the first phase of the Hundred Years' War. The character is loosely based on the historical knight Neil Loring. 1356 is the fourth novel in The Grail Quest series by Bernard Cornwell. It is set in 1356, nearly a decade after the original trilogy, and culminates with the Battle of Poitiers. Intertwined in the plot is the quest to find La Malice, a fabled sword of Saint Peter and Christian relic which may turn the tide of the long war for France. Archambaud de Grailly was Viscount of Castillon and Gruson from 1356 until his death, and from 1369 Count of Bénauges and Captal de Buch. He was the younger son of Peter II of Grailly and his wife, Rosamburge of Périgord and was Count of Foix by his marriage to Isabella, Countess of Foix.